Improve efficiency, higher accuracy and reduced downtime. 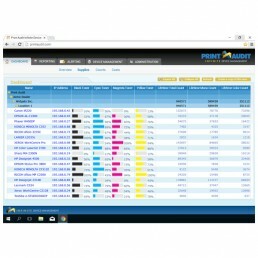 Want print audit installed on your machine? Receive accurate billing through automated meter readings being sent to us on an agreed date. Only pay for what you have used, eliminating these processes ensures that your costs can be tracked more effectively and billing becomes straightforward. Never have to worry about sending us emails or calling us to order in new consumables such as toner. Full automated system means we get notified when you are running low, providing replacements in time, when you need them. Automated software updates will be run on your machines to ensure the most up to date Print Audit software has been loaded to provide our clients with the best possible managed print services and solutions based on their needs. Automated service report alerts are sent from your machines to our head office. We can then evaluate any service issues that may need addressing and provide the best solution to reduce downtime or inconvenience. We are able to track your meter readings, toner levels and any service or maintenance issues that may need attending to. This is all automated making it easier for our clients to get back to what they do best. This software can also help to improve efficiency, reduce costs and save time!